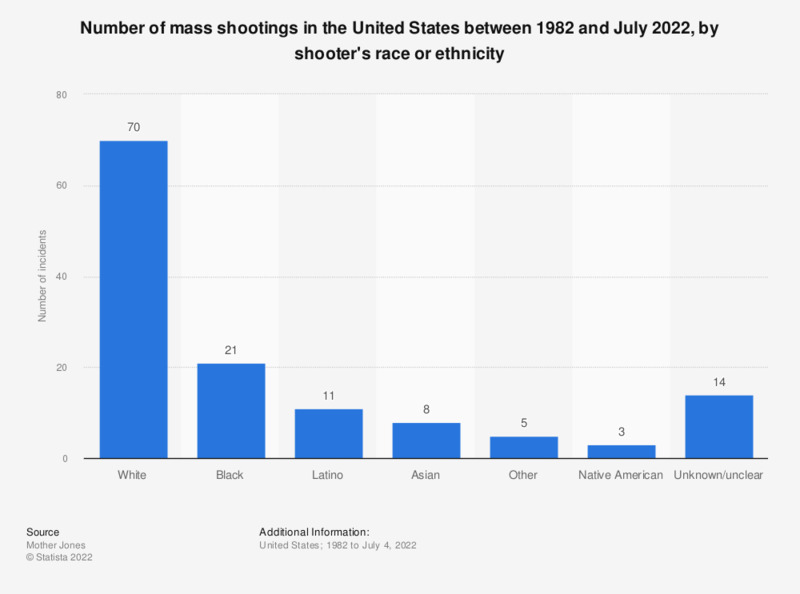 The statistic shows the number of mass shootings in the United States between 1982 and February 15, 2019, by race and ethnicity of the shooter(s). Between 1982 and February 2019, 62 out of 110 mass shootings were initiated by White shooters. The Las Vegas strip massacre in 2017 had the highest number of victims between 1982 and 2018, with 58 people killed, and over 500 injured. The high number of tragic mass shootings that have occurred in the United States has led to a large amount of attention on the profile of the people who commit such violent acts. A look at the worst mass shootings in the United States suggests no clear common connections other than a tendency to undertake mass shootings in educational institutions and other populated areas. However, a look at mass shootings in the United States by gender shows a great majority of mass shootings are carried out by men. With no clear patterns between the socio-economic or cultural background of mass shooters increasing attention has been placed on mental health. Analysis of the factors American’s considered to be to blame for mass shootings showed 48 percent of people felt the inability of the mental health system to recognize those who pose a danger to others was a significant factor. Further attention has also been given to the factors influencing the behavior of mass shooters. Surveys on violence in the media and drug use as potential factors show that many Americans place blame on these influences. In the wake of multiple mass shootings critics have sought to look beyond the issues of shooter identification and their influences by focusing on their access to guns. The study mentioned above showed 61 percent of Americans felt the easy access to firearms was to blame by either a “great deal” or a “fair amount”. Do you think the shooting of Trayvon Martin by George Zimmerman in Florida was justified of unjustified? Do you agree with the following statements on violence against women?